Simicur Graphicur ensures optimal metabolism of the skin. 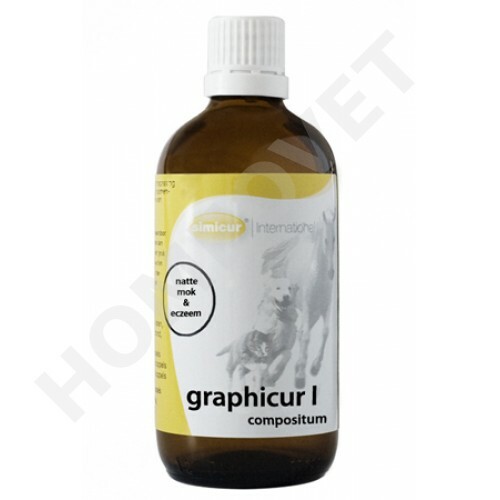 Graphicur has a regulating effect on chronic skin rashes (inflammation) and is therefore relevant for the treatment of wet and dry cracked heels, dry eczema and dandruff associated formation of cracks. In preference in combination with Simicur wound spray, in severe cracking, grease the cracks with Simicur ointment. Simicur Graphicur administered orally via drinking water or enter directly into the mouth. Horse / Pony 2 x 30 drops daily. Dog 2 times daily 15-25 drops. Cat 10 2 times a day - 15 drops.